It is the mission of Cooper Hewitt’s staff and Board of Trustees to advance the public understanding of design across the thirty centuries of human creativity represented by the Museum’s collection. The Museum was founded in 1897 by Amy, Eleanor, and Sarah Hewitt—granddaughters of industrialist Peter Cooper—as part of The Cooper Union for the Advancement of Science and Art. 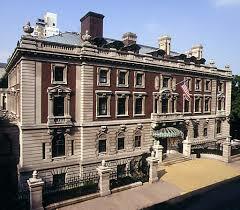 A branch of the Smithsonian since 1967, Cooper-Hewitt is housed in the landmark Andrew Carnegie Mansion on Fifth Avenue in New York City. The campus also includes two historic townhouses renovated with state-of-the-art conservation technology and a unique terrace and garden. Cooper Hewitt’s collections include more than 217,000 design objects and a world-class design library. Its exhibitions, in-depth educational programs, and on-site, degree-granting master’s programexplore the process of design, both historic and contemporary. As part of its mission, Cooper Hewitt annually sponsors the National Design Awards, a prestigious program which honors innovation and excellence in American design. Together, these resources and programs reinforce Cooper Hewitt’s position as the preeminent museum and educational authority for the study of design in the United States. The Museum is housed in the former home of industrial magnateAndrew Carnegie. The sixty-four-room mansion, built from 1899 to 1902, is an impressive testament to the desire of Carnegie and his wife, Louise Whitfield Carnegie, to build a spacious, comfortable, and light-filled home in which to raise their young daughter, Margaret. The house was also planned as a place where Carnegie, after his retirement in 1901, could oversee the philanthropic projects to which he would dedicate the final decades of his life. From his private office in the mansion, Carnegie donated money to build free public libraries in communities across the country and to the improvement of cultural and educational facilities in Scotland and the United States. The mansion was designed by the architectural firm of Babb, Cook & Willard in the solidly comfortable style of a Georgian country house. When Carnegie purchased the land for the house, in 1898, he purposely bought property far north of where his peers were living. The relatively open space allowed him to build a large private garden—one of the only ones in Manhattan—that is still a beautiful, restful oasis today. The house is a fascinating study in innovative design. Completed in 1901, it was the first private residence in the United States to have a structural steel frame and one of the first in New York to have a residential Otis passenger elevator (now in the collection of the Smithsonian’s National Museum of American History in Washington, DC). Another innovation was the inclusion of both central heating and a precursor to air-conditioning. In the cellar a pair of enormous twin boilers ran by coal transferred from storage bin to furnace by a coal car that traveled over a miniature railroad track. The building received landmark status in 1974, and in 1976 reopened as Cooper-Hewitt, National Design Museum, Smithsonian Institution. It was renamed Cooper Hewitt, Smithsonian Design Museum in 2014. 4, 5, or 6 Train to 86th St. and Lexington Ave.
M1, M2, M3, M4 to 5th Ave. and 90th or 92nd St.
M1, M2, M3, M4 to Madison Ave. and 91st St.
M96 to Madison Ave. and 94th St.